HopCat has brought great craft beer to locations across the midwest and now Minneapolis has one to call their own! Here’s a look at the HopCat location in downtown Minneapolis. 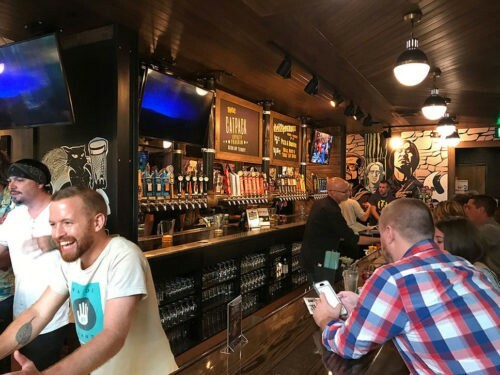 Known of their Crack Fries and craft beer selection, Michigan’s HopCat has expanded across the midwest to more than 15 locations and now has one in downtown Minneapolis. Located on Nicollet Mall, the downtown location is steps from the Light Rail line, right in the center of the city. With plenty of street and ramp parking nearby parking shouldn’t be an issue in this area after the work crowd clears out (a spot may be a bit harder to come by during the workday). The patio at HopCat Minneapolis is huge. 8th Street Bar & Grill use to claim they had the largest ground-level patio downtown but I’m sure that award now goes to HopCat. It also positioned to get plenty of late-afternoon sun, so bring the sunglasses. Inside offers a large double-sided bar and tons of tables and booths. Multi-colored glass lets in happy lighting and the atmosphere is upbeat and energetic. There’s a really cool HopCat hop logo made of recycled kegs and old bikes and a unique hand-painted mural adorns the back wall, so be sure to check them out. With 80 beers on tap and plenty of bottles, HopCat Minneapolis is sure to have something for everyone. They dedicate at least 30 (usually more) of their taps to Minnesota beers, so the local game is strong. They carry a nice selection of styles, with plenty of seasonal offerings mixed with well-known mainstays. Taps often include limited release brews and they frequently host special tapping events and tap takeovers. They also have a number of Belgian brews available, both on tap and in bottles. Their beer menu is ever changing and does a nice job breaking things down by style and taste, so finding something to fit your feeling (or food) is easy. The bartenders are always a good source if you’re looking for a particular flavor to feed a need, have a question, or want to try a brew or two. If it’s comfort food you seek, HopCat has you covered. Their Crack Fries are what they’re famous for (aside from the beer selection) and come in a couple variations. The loaded version (seen here) adds cherry-smoked bacon, red onion, & pickled jalapeños on top of beer-battered fries seasoned with their signature cracked black pepper seasoning with warm cheese sauce. With their beginnings in Michigan, the Detroit-style pizza is another delicious choice. Meaty McMeaterson is a must for the meat lovers. They’re the perfect size for a hungry single person or sharing with a friend if you want to feel like less of a fatass. Killer Mac & Cheese, The Grand Royale, and The Kitchen Sink round out the comfort food festivities, along with plenty of burgers, sandwiches, and appetizers. The prices for everything are reasonable and the portion sizes are plentiful. Fill up on food to go with the big list of beer choices. 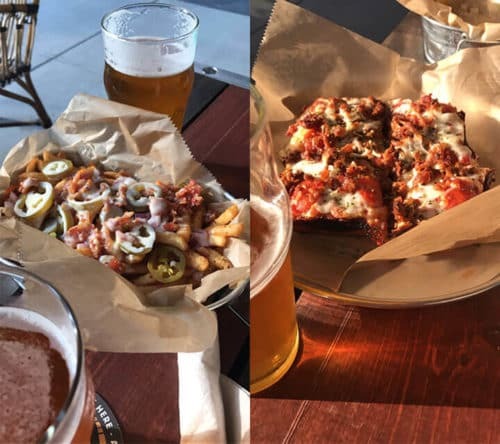 With over 80 beers for the craft beer fan to choose from and plenty of food to balance the buzz, it’s great spot to grab a bite and a few beers in downtown. They offer the largest beer selection in the downtown area and are another welcome addition to the Minneapolis beer bar scene. 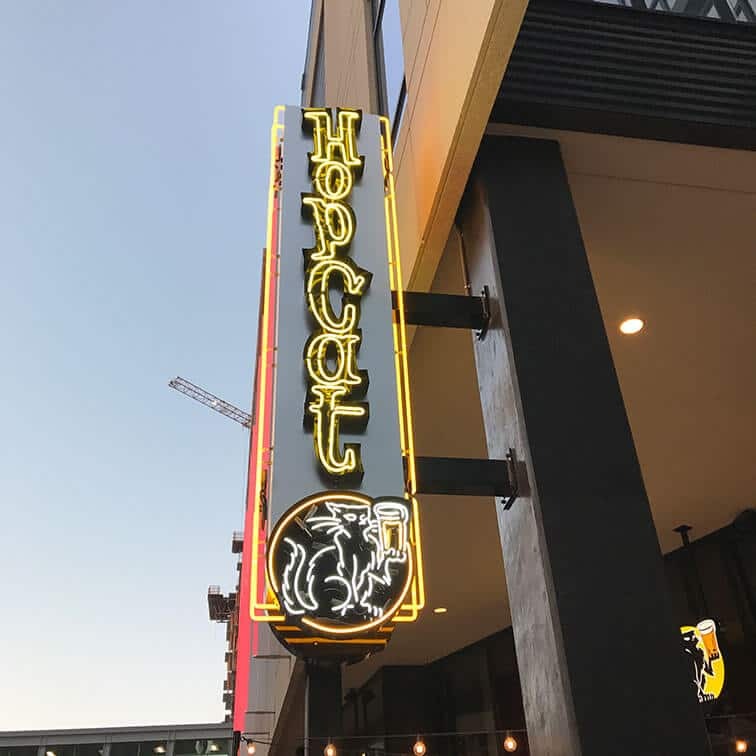 Drop down to HopCat Minneapolis and have a drink or two before taking the Light Rail to an event at Target Field, Target Center, or US Bank Stadium (or just because). Be sure to start things out with some Crack Fries.